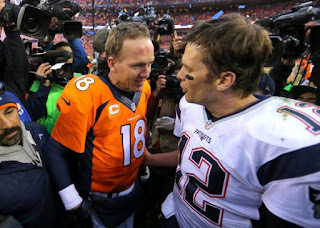 What if Tom Brady and Peyton Manning switched places? I'm not talking about for all time, or even this full season--I mean just for last Sunday's matchup. And obviously this can't be taken literally with them simply each walking to the other side of the field before the AFC Championship Game. What I'm asking is, what would've happened if Tom Brady was the Broncos quarterback (fully assimilated to his new teammates and system) and Peyton Manning was on the Patriots? Before I venture a guess, I have to admit that I didn't come up with this idea on my own, I heard it on Bill Simmons' podcast. Brady got knocked down 23 times last week by an outstanding Denver defense--nearly twice as many hits as he had absorbed in any game during the course of the season. Yet somehow, he was still able to lead his club on a final drive that got them within a failed two-point conversion of sending the game to overtime. Manning, on the other hand, guided the Broncos to just three points and four total first downs in the second half. He didn't record a single first down on eight of 14 total possessions. Imagine what might've happened had he been beaten up by the Denver defense all day? My guess is the Patriots would've been shutout with Manning at the helm instead of Brady. Score prediction if they switched places? Brady/Broncos 31, Manning/Patriots 0. According to My Top Sportsbooks, Carolina is favored by 4.5 points over Denver in Super Bowl 50. But what if the Broncos had Brady under center instead of Manning? A line of even money sounds about right, although it wouldn't surprise me at all if Brady's squad was expected to win. In that case, I'd say Brady/Broncos 31, Panthers 28. As it is, I'll take Panthers 35, Manning/Broncos 17. The Panthers' score differs by seven because unlike Brady, I expect Manning to throw an interception that leads to a touchdown.